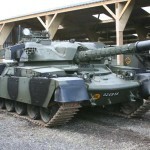 The British Chieftain Tank FV4201 was the first and most powerful Main Battle Tank in NATO during the former Cold War. 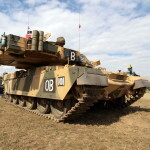 First deliveries to the British Army were completed in 1966 and was finally withdrawn from service in 1995 as its replacement the Challenger 2 entered service. 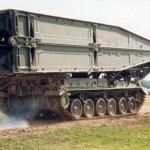 A number of Combat Engineer Vehicles were built on the hull. 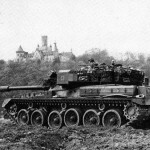 Whilst the British Centurion Medium Tank had been a great success, the development of its replacement started in 1951. 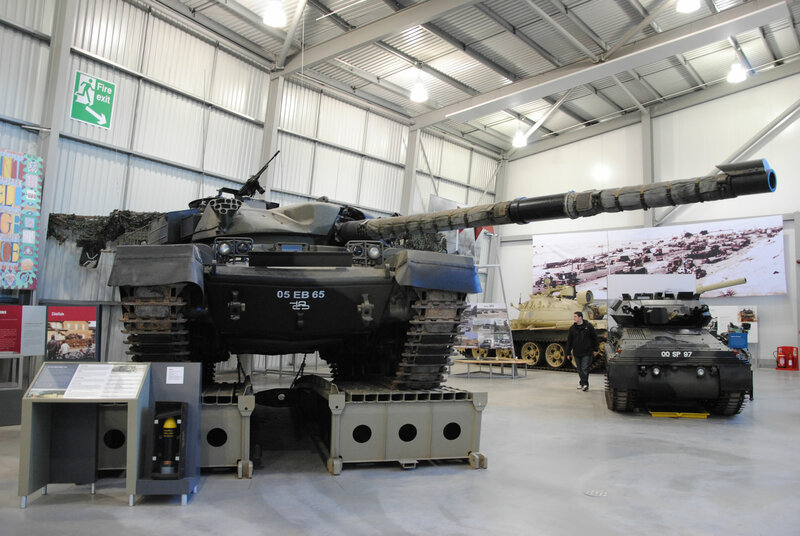 Known as the “Medium Gun Tank No 2” emphasis was put on its firepower, then protection and finally mobility to insure its survivability whilst not exceeding a weight of 45 tonnes. By 1956 concept studies by the Fighting Vehicles Research and Development Establishment (FVRDE) had looked at various gun types, propellants and calibre. These resulted in the recommendations that a 120mm bore calibre main gun would be needed to defeat current and future Soviet Heavy Tanks at the ranges initially required. 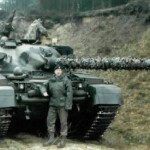 These studies had also concluded that a 2 part ammunition should be used, rather than 1 part, which at 120mm would be a lot larger and heavier. Leyland (who were manufacturing the Centurion) were the prime-design contractor of the new vehicle, which was now officially designated the FV4201. The company produced 3 vehicles to test the vehicles proposed suspension (using Centurion parts), the new turret and most importantly the new drivers reclining chair in 1956. 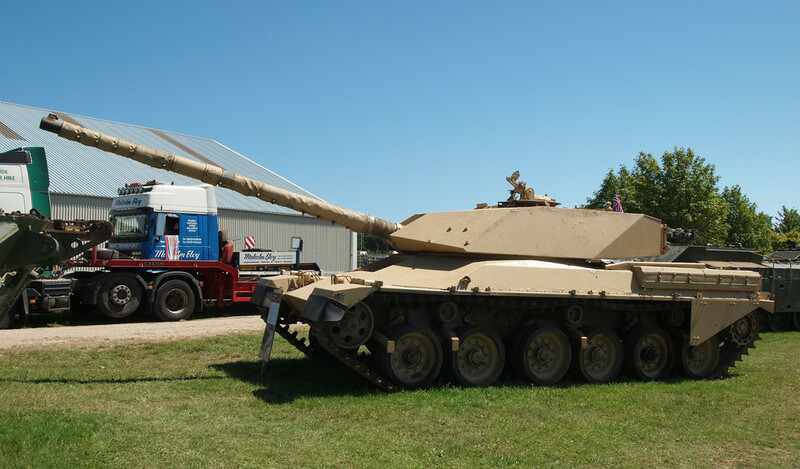 These 3 vehicles were designated FV4202 and unofficially the 40-tonne Centurion. 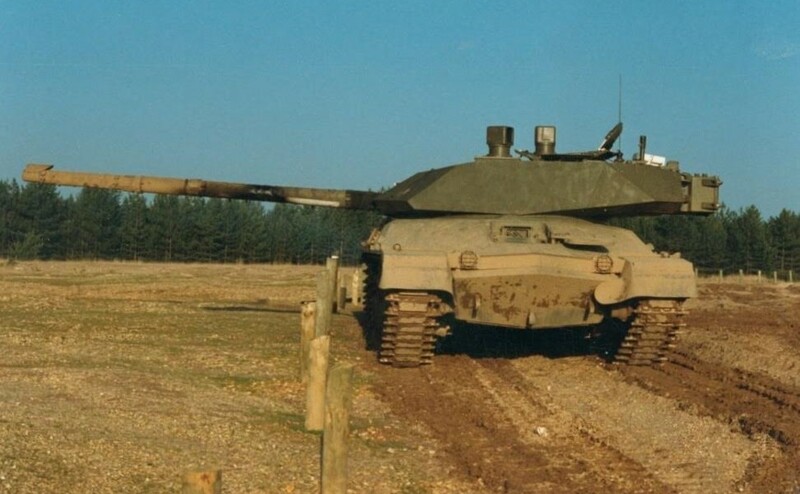 Traditionally a tank driver would sit up right in his station, which would require a higher steel constructed hull and thus increase the tanks weight. The new drivers reclining chair meant that he was almost lying backwards, the hull height could be reduced resulting in a lighter tank that did not exceed 45 tonne. 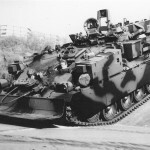 The FV4202 vehicles were not fitted with a gun mantle as they were not used for firing trials in the Chieftains developement. 1 still remains in storage (pictured above) at Bovington Tank Museum. During 1957 the Chieftains development took 3 design blows. Firstly the steel armor needed to be made thicker and secondly the gun elevation on both the – and + axes had to be increased resulting in an enlarged heavier turret. The third blow would haunt the FV4201 for some decades to come. 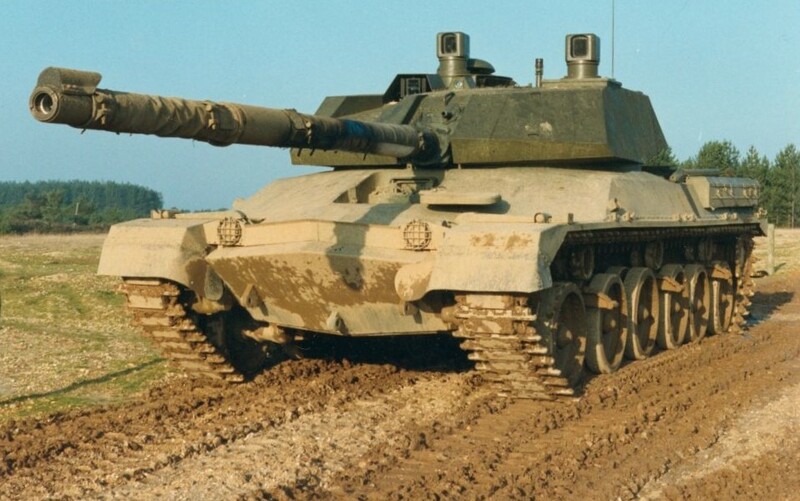 As a member of NATO, the UK had to comply with Standardization Agreements (STANAG) and in that year a new STANAG was passed that all Fighting Vehicles engines had to be multi-fueled, that is they could run on anything from heating oil to jet-fighter fuel. Not only did this mean the original Rolls Royce engine was replaced with a modified German designed aircraft engine (later manufactured as the Leyland L60) but the hull design had to be reconfigured to fit the larger engine and pushed the vehicles overall weight pass 45 tonne. In 1959 the final design wooden mock-up of the FV4201 was completed by FVRDE. Leyland had been responsable for the hull and automotive components (Self-Changing Gears ltd designed the TN12 transmission) and Vickers-Armstrong developed the turret. In the same year six prototypes were ordered (P1 to P6) and a follow on order for an additional six (bringing the total to 12) was placed with production shared between the Royal Ordnance Factory Leeds and Vickers-Armstrong. 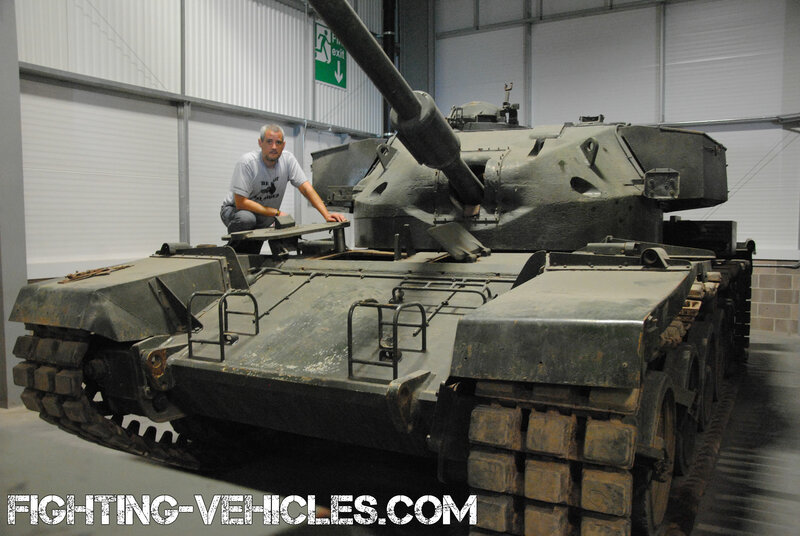 Testing and trials of the prototypes started in 1960, which included firing trials of the main gun, its sub-systems and endurance trials testing the automotive components resulting in changes to the design as each prototype was built. The initial mechanical rammer used to push the projectile (the first part of the round) into the breach was removed, once the Loader realised he could use the second part of the round, the Combustible Case Charge as the rammer. 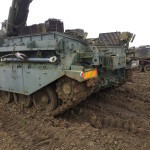 The vehicles low ground clearance also proved a problem in very wet soft mud as the vehicle would sink and get banked by the mud under the hulls belly. Changes to the suspension to increase the ground clearance were made and to also cope with the additional weight from other design changes. 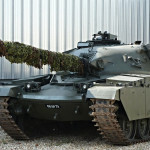 The FV4201 was accepted into British Army service in 1963 and named the Chieftain. The L11 main gun was specifically developed for the Chieftain. It wasn’t the first tank gun to have a bore calibre of 120mm, but was the first to have a calibre Length 55 making it the most powerful tank gun in NATO. The decision to make it so long was to increase the muzzle velocity (the speed measured of a projectile when it leaves the muzzle) when firing Armor Piercing Discarding Sabot rounds. The increased length meant the round had a great distance to travel in the barrel and allowed the explosive energy to build up behind it. The higher m/v meant the AP rounds travelled faster, which increased their penetration capability and travelled further giving a greater range compared to other tank guns. The L11 was deemed so effective that it could penetrate any future Soviet Tank design for the foreseeable decades. The L11 used a 2 part ammunition, though some consider it as 3 part. The first part is the projectile. 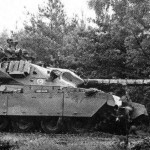 These were commonly the L15 armour-piercing discarding sabot (APDS), L23A1 armour-piercing fin-stabilized discarding sabot (APFSDS), L31 high explosive squash head (HESH) and L34 Smoke round. The 2 part ammunition offered a number of advantages over 1 part ammunition was all encased in a brass shell. It was smaller, therefore easier to handle by the loader. It was safer to store, as HESH and the charges could be kept below the turret ring and the AP projectiles stored in the rear of the turret bustle. Its reduced size meant more rounds could be carried. The Chieftains L60 engine was designed and manufactured by Leyland. It was an opposed piston, two-stroke engine design. The L60 was capable of running on various fuels as required by NATO at the time. It was discovered during trials that to modify the engine’s fuel feed from diesel to another fuel could take up to 8 hours. 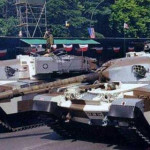 The NATO multi-fuelled concept was later abandoned by other NATO countries due to reliability issues, however it was left to late for the British to come up with a new engine following modifications to the tanks design to accommodate the L60. 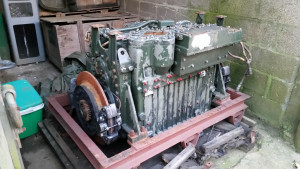 The Chieftains transmission (gearbox) was the TN12 by Self-Changing Gears ltd. The TN12 was operated by way of a kick pedal. The driver would change gears up by pressing the bottom with his heel and down gear by pressing the pedal top with his toes. First production model, with No 11. Mk1 Commanders Cupola and Mk4A engine. Total of 39/40 built. Mk 2 Chieftain with improvements to the suspension and installation of the Mark 6A L60 engine. Sub Marks given to when Tank Laser Sight and Muzzle Reference System installed. The Mk 5 was the finalised production Mark that incorporated all earlier Mark modifications. Firepower improvements included increased 120mm ammo storage to 64 rounds (including modified charge bins), new thermal sleeve commanders and gunners sighting equipment modified. NBC pack changed. Gearbox was strengthened and the L60 MArk 7A engine installed. The Mark 5 entered service in March 1972. Re-designation of the Mk 5 when “L” and “MRS” were added. Re-designation of the Mark 9 once fitted with Stillbrew appliqué armor. Stillbrew was a non-reactive armor made up of rubber pads cross layered. When struck by HEAT ammunition they distort the path of the copper jet. It was moulded and applied across the front of the turret and around the drivers station. Re-designation of the Mark 10 when fitted with Thermal Observation and Gunnery System, aka TOGS. 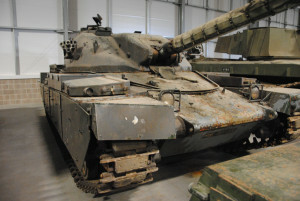 A total os 324 Chieftain were bought up to the Mk 11 standard. 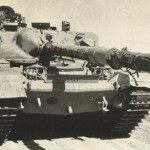 Developed for the Israeli Defence Force with the hope of Israeli licensed production, 2 prototypes were built and sent to Israeli for local testing and trials. The deal was cancelled by the UK in late 1969 due to objections from neighbouring Arab nations and both prototypes were returned to the UK. They are believed to have been sent to the USA for evaluation purposes. 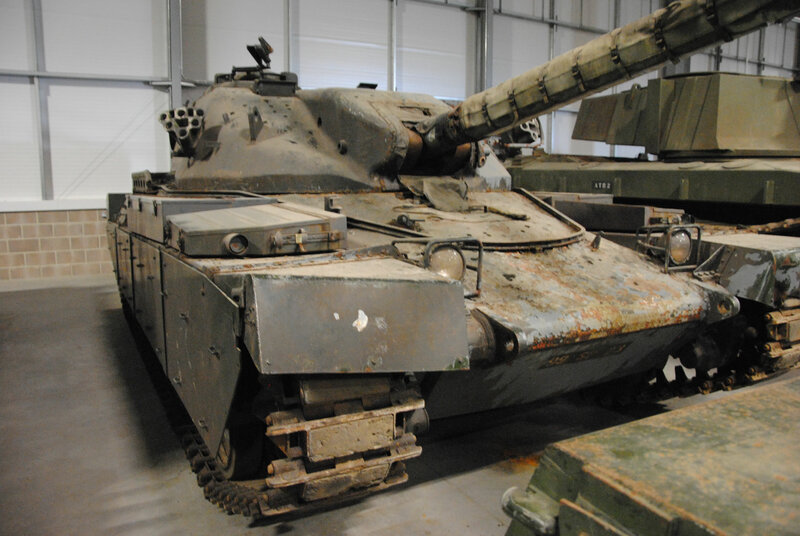 British Army Mk 5 standard sold to Iran in the early to mid-1970’s. 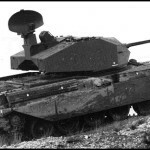 FV4030/1 “Shir 2” – A reworked/modified hull (noted by its flat lower glacis) and new turret fitted with Chobham Composite armor, it was also fitted with hydrogas suspension. Despite being named “Shir 2” development had started prior to to the Shir 1. 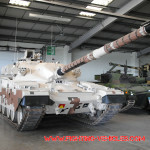 A number of models were developed for the export market based on the Chieftain, which in some cases had modified hulls and turrets so that Chobham Armor could be fitted, as well as improved engines and the latest Fire Control System technology. These were designated “Chieftain” followed by a number. In some cases the number represented the Horsepower the engine had been governed too. CV12 power pack, mock up Chobham armor. CV12 power pack, mock up Chobham armor, advanced optics, and night vision, fitted with Hydrostrut suspension. Normal hull with mods, such as square final drive housings, rear exhaust box removed louvres fitted instead, large one piece rear decks, 1000bhp MTU pack coupled to Renk transmission. Only one built now lives at Elvington air museum. 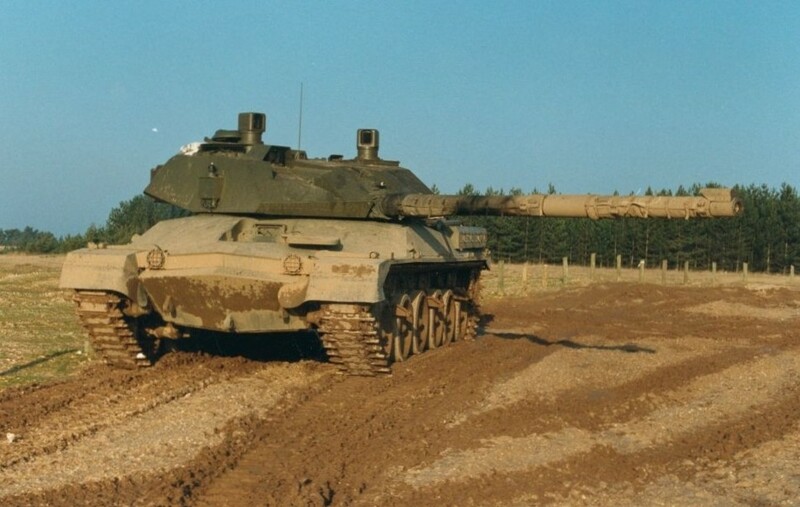 It was the Most powerful automotive chieftain built, when going flat-out and brakes applied it would stand on end sort of pose like the FV510 Warrior Infantry Fighting Vehicle. Standard hull with CV12 pack and turret from the Chieftain 900. 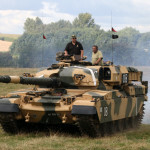 The Chieftain was also built-in different variations, these included the FV4205 AVLB, the FV4204 ARV/ARRV (Armoured Recovery and Repair Vehicle), the Chieftain Mine Clearer, the Chieftain ARVE (Armoured Vehicle Royal Engineers) the Chieftain Sabre-Twin 30 mm AA turret and the Weapon Carriers, where the Chieftain chassis was modified to mount air defence weapons (“Marksman” 2 x 35 mm cannon). Kuwait – 165 Mark 5/2K ordered with deliveries starting in May 1976. Oman – 27 delivered. 12 were used British Army Mark 7/2C and 15 new Mark 15. Still in service. 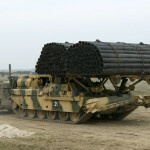 Iran – 707 Mark 3/3P and 85 Mk 5P delivered. In addition 71 ARV and AVLB were delivered. 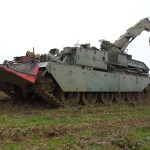 Still in service, an unknown number have been upgraded to the “Mobarez Tank”. Iraq – Small number of Iranian Chieftains were captured in the Iran Iraq War. Jordan – 278 Khalid ordered in 1979. Still in service. Great Britain – Almost 1000 were built, from Mk 1 to Mk 5 and later all earlier Mk were bought up to the Mk 5 standard. 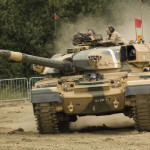 The Chieftain Replacement Program eventually resulted in the Challenger 2 as its official replacement, finally being withdrawn from service around 1995 and its Combat support vehicles in the mid-2000’s. Roughly 2265 Chieftains were built from 1965 to 1985. 1980 to 88 Iran Iraq War – Operated by the Iranian Army, some were captured by Iraq from Iran. 1990 Iraq Invasion of Kuwait – Initially deployed by Kuwaiti Forces in defence of the invasion, 50 Chieftains joined the withdrawal of Kuwaiti Forces in to Saudi Arabia, only to return and participate in the Liberation of Kuwait in 1991. 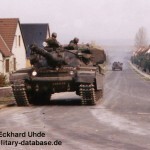 1991 Gulf War – Other than those used by Kuwait, the British army only deployed Combat Support based Chieftains (such as AVRE) to aid their Challenger 1 Main Battle Tanks, whilst the Chieftain Mk11 remained stationed in West Germany.